Kangaroo Island doesn't have the plagues of introduced species that have caused so much damage on the mainland: no rats, rabbits or feral cats and foxes. It does have the rare, Italian, Ligurian honeybee, and boasts the purest remaining strain of these in the world. But it isn't just superlative honey. 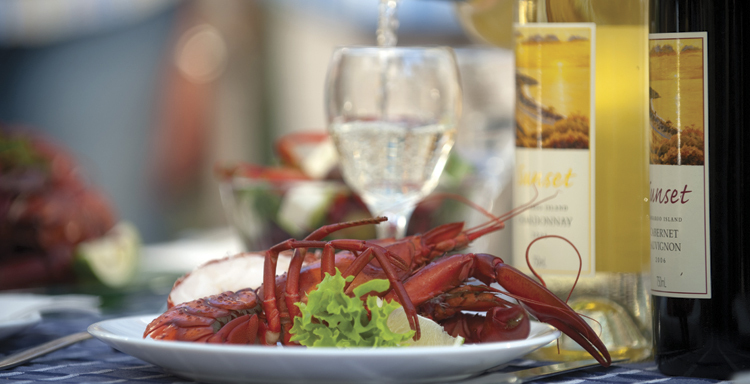 Cold-water seafood and fine cooking combine with all the other great grub available on Kangaroo Island to make it a foodie's paradise. Kangaroo Island is famous for its wildlife: plants and animals thrive in a profusion now rare on the mainland where Australian natives must compete with introduced species absent on the island. But there are other attractions – not many people know that Kangaroo Island is probably as close as it gets to an Australian foodie Utopia – and being 4,000 square km in size and 100km from Adelaide’s coastline it’s easier to find than More’s Utopia. There’s enough fresh food, drink and produce to keep even the gourmands amongst us busy. The abundance of fresh and salt-water crayfish, oysters, prawns, barramundi, lobsters and whiting swimming in and around the island is enough to turn the most hardened omnivore into a piscivore. Clamber ashore and you’ll find the other food groups are possibly even more enticing. Free-range chickens and eggs from the north-eastern corner have got lunch and breakfast covered while any number of cheeses provide the perfect accompaniment to the delights on offer from the island’s 28 wineries. Throw in the world’s only pure strain of Ligurian bees producing the cleanest of honey and all diets are out the window. It may be Australia’s third biggest island but you can still do a gastronomic tour that samples a range of what’s on offer and be home for dinner. For instance you might like to start late morning at American River on the east coast and make your first port of call the Island Beehive where you can learn and taste exactly why the Ligurian bee is so important. Five minutes down the road you can get your claws into some of the finest Southern Rock Lobsters and King Crabs to be pulled from Australian waters at Ferguson Australia. Another 20 minutes away at the Island Pure Sheep Dairy on the banks of the Cygnet River is a haven for Mediterranean cheese lovers. A long-term genetic selection programme is reaping rewards in the form of some of the tastiest sheep’s milk in the world. Visit between 3pm and 5pm and you’ll catch milking time – provided you make it past the tasting room. Make sure you don’t leave it too late to make it to Sunset Winery and take in, well, the sunset over a glass or two of sparkling Shiraz or Chardonnay. And with that your appetite should have been whetted just enough for dinner.